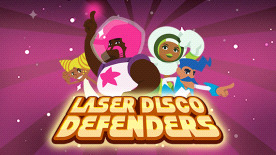 Join the Laser Disco Defenders on their quest to defeat the evil Lord Monotone and prevent him from using the coveted Mirror Moon to force the galaxy into dancing along to his, and only his, tune. In this self-inflicted bullet hell you must stay on your toes as each laser beam fired ricochets off walls and can hit you too! Traverse randomly generated levels and face off Monotone's various robotic machinations. Be it flamboyant flame sneakers or a cool rapid fire chrome suit - you decide how your favourite disco defender looks and plays based on what outfit you choose to wear. Time to save the galaxy and look like a cool cat! • Online leader boards shows you the "master of the dance floor"